I’ve been thinking lately about art and the power that it wields. Now, when I say “art,” I don’t mean just the highbrow stuff that few people (least of all me) have access to. I’m talking about the art we see everywhere–in our books, our movies, our fashion, even (dare we admit it?) our tv shows. We call it pop art and, though naysayers claim its commercial and diluted (they’re probably right) it seeps into and shapes our reality, and therefore deserves our consideration. And the thing I’ve been thinking about lately is how easily we give ourselves over to the Artist, so hungry are we for the Art. We enter this world starving for art. We want to consume it, and we want to create it. 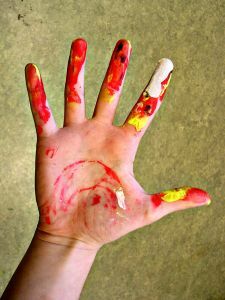 And it’s a good thing that art does take varied forms, because that makes room for all of us–the painter, the seamstress, the carpenter, the drummer, the baker, the writer, the party planner, the scrapbooker (not kidding), the cellist, the executive, the interior designer–to become artists. And that becoming is what makes our lives interesting, and meaningful, and fun. It’s what gets us through the drudge. You may not see yourself as artistic, but can you imagine a life without your own creativity? My brother-in-law is a master on the Traeger–you know, that fancy barbeque thingamajig that every red-blooded man lusts after these days? My BIL makes a smoked tenderloin in that thing that, when tasted, flings us straight up to the gods. That’s art. We enter this world starving for art. We want to consume it, and we want to create it. if we are born to be Artists, why do we surrender our creative space and time to the likes of, say, Chelsea Handler or Miley Cyrus? Why do we make room in our fascinating, fantastic brains–that are just crackling with ideas and energy–for Fifty Shades of Gray? Why do we–so armed with ingenuity and curiosity, with inventiveness and wonder–give our tremendous power of artistic consumption to the undeserving? I’m not talking about snobbery here, I’m talking about virtue. And when I say virtue, I’m not talking about religion, I’m talking about power. Did you know that virtue also means power? Few things are more (quietly) powerful than art and so, in its truest form, art is a manifestation of virtue. Pure in its desire, sincere in its effort. Principled. Powerful. Created, and given, with benevolence. My brother-in-law’s tenderloin, my sister-in-law’s crosstitch, my daughter’s piano sonata, my husband’s marketing strategy? Art. What do you do that’s pure in intention, sincere in effort, given with benevolence? That’s your art. Don’t be afraid of it. Create it, and then give it away. Give it to others. Give it to me. Our need for art is like a vacuum, and if you don’t fill it, someone else–like Robin Thicke or Kim Kardashian or that horrible CEO of Abercrombie and Fitch–will. I don’t believe these kind of artists are sincere in their efforts, and I don’t think they give with benevolence. I believe they take–our money, mostly–and we allow them to, because it seems that no one else is offering anything better. That’s where you come in. The World of Art needs you and, more importantly, you need your Artistic Self. Because the more time you spend creating the good stuff, the less time you’ll spend consuming the junk. What are you good at–or even kindasorta good at? What do you enjoy doing? What, once you get started, makes you forget to eat? (That’s how I gauge a real passion.) What do you just have to “get right?” What do you create sincerely and give away benevolently? Where do you find your power, your virtue? That’s your art. Stop apologizing for doing it badly and just do it. Do it badly, then do it better, then do your best and then give it away. Give it to others. Give it to me. Because we live in a world of fakers, and we are starving for the real thing. We are starving for your imagination and ingenuity, for your vision and virtue. We are starving–my original and authentic, my principled and passionate–friend, for you. Previous Article I look good.